Facility management refers to a kind of interdisciplinary field which primarily focuses on coordinating space, organization, people and infrastructure that are often linked to business services functions including arenas, offices, convention centers, hotels, shopping complexes and hospitals. Note, however, that this field does not only cover the process of facilitating business services and activities. It is also important for you to note that about two different types of definitions for facility management are now available. The first definition of facility management is that it is the first field which focuses on using official national, global norms and standards and continental standards. The second one is more focused on offering excellent commercial standards and norms. One of the major reasons why the facility management process continues to capture the attention of many is because it serves as a horizontally oriented and an umbrella market. It has become increasingly relevant to the central business operations of an organization. This makes the whole facility management process to be a huge help in converging with information technology, human resource and real estate. If you want to become an expert in facility management, then it is advisable for you to know that your roles and responsibilities will include ensuring regulatory and corporate compliance and properly operating all the essential aspects associated to a building with an aim of creating a safer, more cost-effective and optimal environment for all its users. 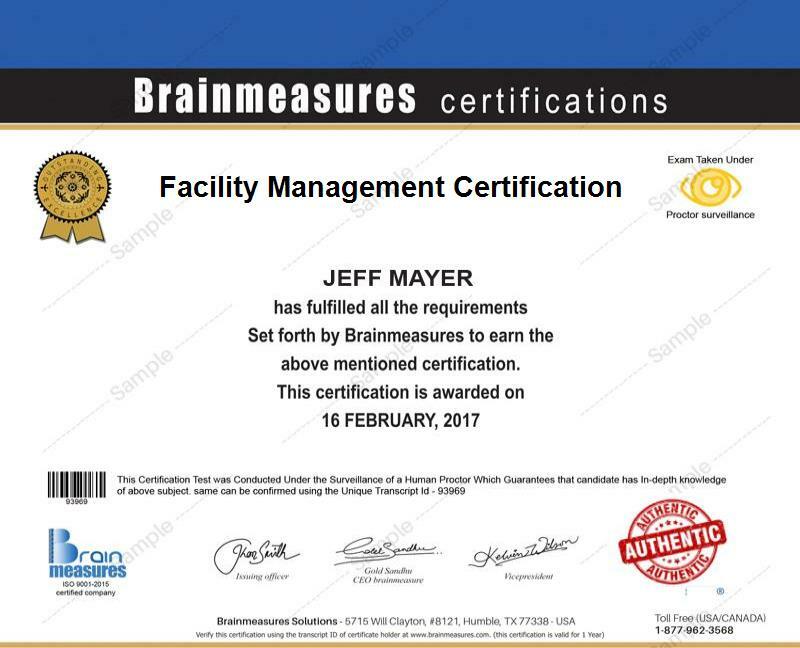 Working as a facility management expert is no longer impossible if you take part in the facility management certification course offered by Brainmeasures. You can expect the Brainmeasures facility management course to offer you all the information that you need to gather about the field so molding your skills and knowledge in this specific area will become greatly possible. The certification course makes it possible for you to undergo a kind of facility management training which is proven to be effective in your attempt to gather all the information that you need to become a more effective and successful facility manager. As soon as you finally take a hold of your facility management certificate, it will no longer become hard to allow various industries and businesses to recognize your unmatched skills and knowledge in the field. How to effectively organize individual departments within a business organization? The facility management certification program from Brainmeasures is proven to be highly effective because of its ability let its participants learn every aspect associated to facility management. You can expect this to work even more effectively for new graduates of interior design, real estate or engineering who is planning to specialize in facilities management and maintenance workers who dream of earning a more professional qualification. You may also find your facility management certification to be a huge help in increasing the level of your salary. If you decide to take advantage of your facility management certification to work as a facility management specialist, then expect to earn around $60,000 to $68,000. You can also work as a facility manager which gives you the opportunity to earn around $54,000 to $116,000. You can earn even more if you deal with an employer who offers an even higher pay.